The last thing anyone wants when trying to clean up after a flood is to worry about getting sick. Any food that may have come into contact with flood water should be thrown out, but kitchen utensils may be saved with proper sanitization. When in doubt, throw it out. Click here to learn how to properly handle food and kitchen utensils after a flood. Parents and caregivers are presented with additional challenges in feeding infants and children safely in a post-flood environment. Click here for tips on feeding your infant or child safely when disaster strikes. Public and private drinking water sources can easily become contaminated during a flood. If public water sources are contaminated, a boil order is issued, while private well owners should have their well water tested before drinking as it may need to be disinfected. Find your local public health agency here. Your home or business and any items inside need to be washed following a flood to prevent health problems. In many cases, household cleaning products are sufficient. Click here to learn more about clean-up guidelines. 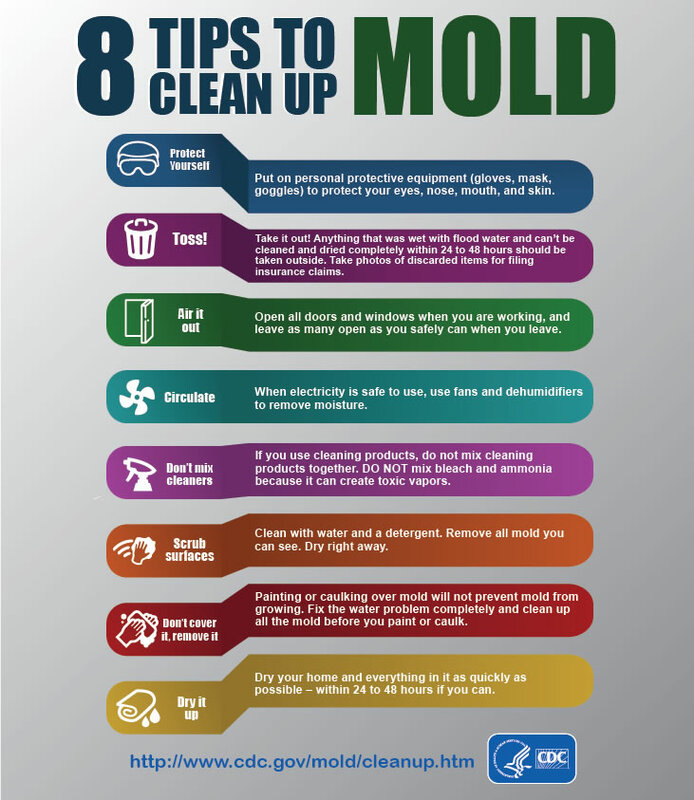 In case of mold, you should take additional precautions. Airborne mold spores are a common allergen. Individuals with allergies to certain types of mold may exhibit allergic symptoms such as sneezing, runny nose, upper respiratory irritation, cough and eye irritation. 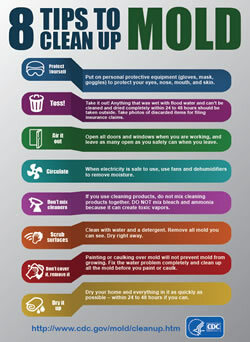 To protect yourself from mold during the cleanup process, make sure you have the proper equipment and take precautions. In order to limit your exposure to airborne mold spores, you may want to wear an N-95 respirator, available at many hardware stores and from reputable companies on the Internet. Wearing long gloves that extend to the middle of the forearm is recommended. And wearing goggles that do not have ventilation holes is recommended to avoid getting mold or mold spores in your eyes. Click here to learn more about mold. Take precautions when using pressure washers. Mosquitoes are a major concern during the aftermath of a flood because the abundance of standing water serves as a breeding ground, creating a large population of these insects that spread disease. Learn how to protect your home from mosquitoes by eliminating standing water and always wear an insect repellant when working outdoors. Click here to find information on obtaining Missouri birth, death, marriage and divorce records lost or destroyed due to recent flooding.